Mouse anti Human DAXX antibody, clone DAXX-01 (MCA2143) used for the detection of DAXX in iSLK cells by immunofluorescence and western blotting. 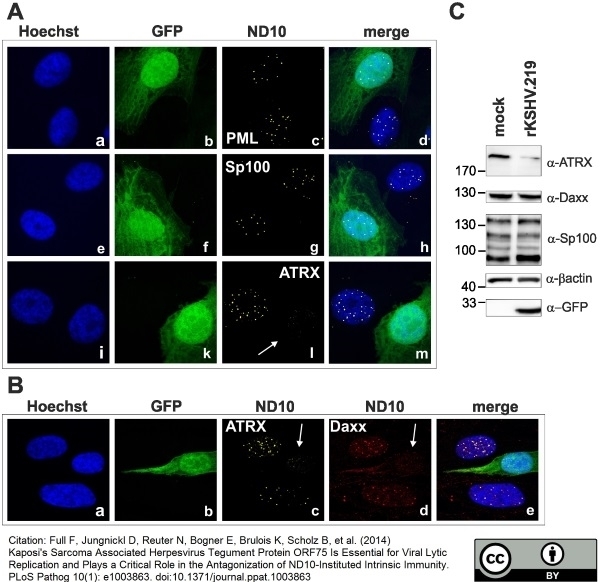 KSHV infection antagonizes the ND10 component ATRX. iSLK cells were seeded onto glass slides, infected with KSHV strain rKSHV.219 for 24A: single staining for PML (c), Sp100 (g) and ATRX (l) B: double staining for ATRX (c) and Daxx (d). Arrows indicate infected cells. C: iSLK cells were infected with KSHV strain rKSHV.219 with high MOI and harvested 20 h post infection. Whole cell lysates were prepared and expression of ND10 components analyzed by immunoblotting. Kaposi's Sarcoma Associated Herpesvirus Tegument Protein ORF75 Is Essential for Viral Lytic Replication and Plays a Critical Role in the Antagonization of ND10-Instituted Intrinsic Immunity. Mouse anti Human DAXX antibody, clone DAXX-01 (MCA2143) used for the detection of DAXX in human foreskin fibroblasts by western blotting. 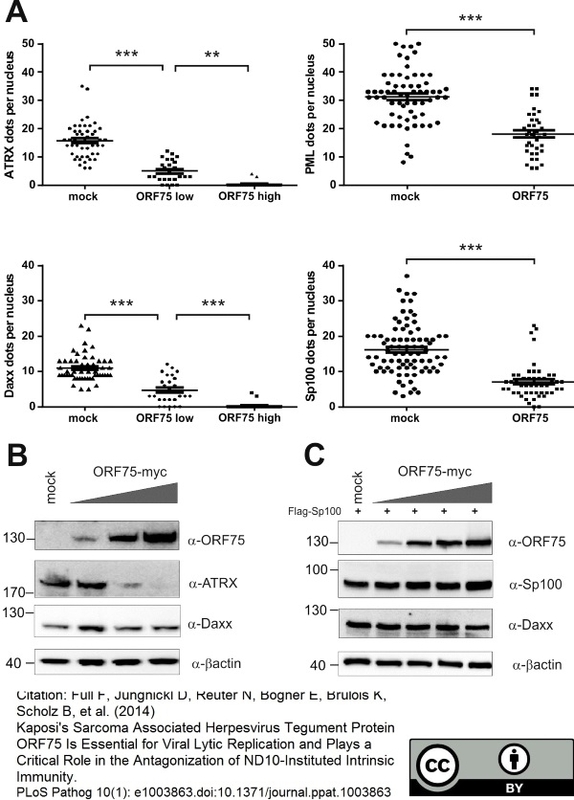 KSHV ORF75 is sufficient for antagonization of ATRX and Sp100. A: HFF cells were transfected with a pcDNA-orf75-myc expression construct. Cells were analyzed by immunofluorescence with a confocal microscope, and at least 50 individual cells per each box analyzed by Fiji. Statistical analyses were conducted using the unpaired t test for SP100 and PML, and one way ANOVA test for multiple comparisons for Daxx and ATRX, respectively, of GraphPad Prism 6 for Windows. **p<0.01; *** p<0.001. B: 293T cells were transfected with increasing amounts of ORF75 and endogenous expression of ATRX and Daxx was analyzed by immunoblot. C: 293T cells were cotransfected with constant levels of Sp100 and increasing amounts of ORF75 and expression of Sp100 and Daxx levels analyzed by immunoblot. Mouse anti Human DAXX antibody, clone DAXX-01 (MCA2143) used for the detection of DAXX in human foreskin fibroblasts by immunofluorescence. Diffuse localization of ATRX after knockdown of Daxx. HFF cells carrying retroviral knockdown shRNA vectors targeting Daxx or PML were immunostained with respective antibodies. 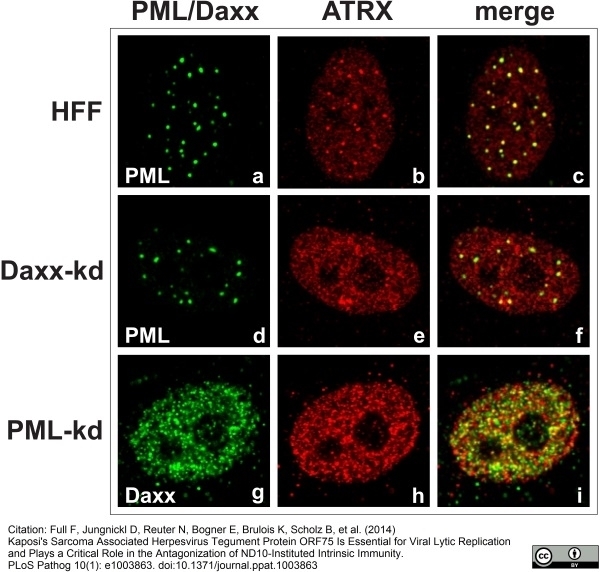 ND10 accumulation as shown by colocalization (c) with PML (a) of ATRX (b) is lost in Daxx-kd cells (e,f) while PML (d) remains in ND-10 structures. In contrast, knockdown of PML (g–i) results in dispersal of ND10 and seemingly a partial colocalization (i) of Daxx (g) and ATRX (h) into smaller structures; most of Daxx and ATRX proteins are not colocalized. Mouse anti Human DAXX antibody, clone DAXX-01 recognizes human Death domain-associated protein 6, also known as DAXX, ETS1-associated protein 1, EAP1 or Fas death domain-associated protein. DAXX is a 740 amino acid ~81 kDa nucleoplasmic protein. DAXX is a regulator of apoptosis implicated in Fas and TGF beta induced apoptosis. DAXX is predominantly a nuclear protein, where it as a repressor of EtsI and Pax3 transactivation. When in association with ASK1 kinase DAXX translocates from the nucleus to the cytoplasm. Recombinant C-terminal DAXX protein (aa 558-740). Boehrer, S. et al. (2005) Daxx overexpression in T-lymphoblastic Jurkat cellsenhances caspase-dependent death receptor- and drug-induced apoptosis in distinct ways. Tavalai, N. et al. (2006) Evidence for a role of the cellular ND10 protein PML in mediating intrinsic immunity against human cytomegalovirus infections. Sourvinos, G. et al. (2007) Recruitment of human cytomegalovirus immediate-early 2 protein onto parental viral genomes in association with ND10 in live-infected cells. Tavalai, N. et al. (2008) Insertion of an EYFP-pp71 (UL82) coding sequence into the human cytomegalovirus genome results in a recombinant virus with enhanced viral growth. Full, F. et al. (2012) Herpesvirus saimiri antagonizes nuclear domain 10-instituted intrinsic immunity via an ORF3-mediated selective degradation of cellular protein Sp100. J Virol. 86 (7): 3541-53. Full, F. et al. (2014) Kaposi's Sarcoma Associated Herpesvirus Tegument Protein ORF75 Is Essential for Viral Lytic Replication and Plays a Critical Role in the Antagonization of ND10-Instituted Intrinsic Immunity. Brown JR et al. (2016) The SUMO Ligase Protein Inhibitor of Activated STAT 1 (PIAS1) is a constituent PML-NB protein that contributes to the intrinsic antiviral immune response to herpes simplex virus 1 (HSV-1).